Located in the north-east of Melbourne, the valley invites you into a transcendental world where every moment feels personally crafted by nature…. At 4.30 a.m. Elvis is crooning from the radio alarm and the only thing that can get me out of the feather-soft duvet and the sprawling king-size bed is the promise of a steaming cup of Nespresso. After an indulgent spa therapy at Natskin Classic Spa the night before, only a shot of Fortissio Lungo would do this morning. The plan is to get on an early-morning hot-air balloon flight to watch the sun rise over the valley. 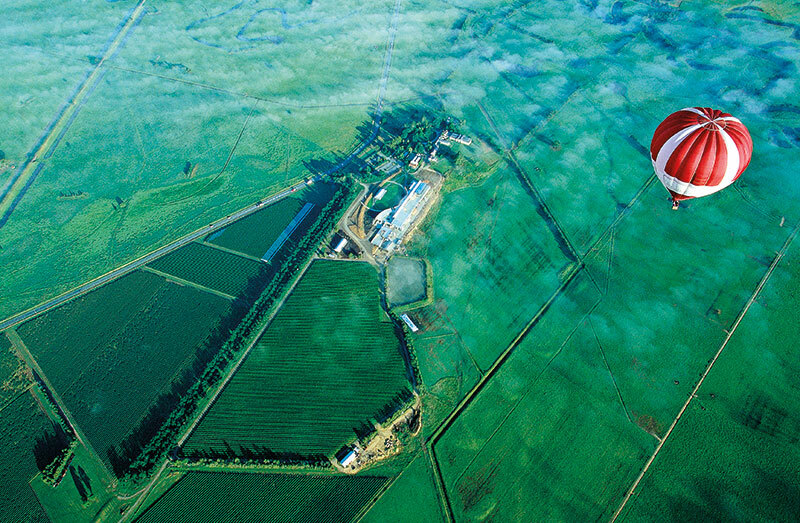 Nothing can be better than to start the day in a balloon, drifting along in the early morning mist. Soaring across the stunning backdrop, the air feels so fresh, crisp and clean that it hits your lungs. Hypnotic — the experience is a feast for the senses. Back on terra firma, a luxurious champagne gourmet breakfast awaits. That’s when I discover that life is full of pleasant surprises! Next on the itinerary: a wander along an interesting walking trail to witness winding paths, and meet up with food and wine producers who are deeply passionate about their produce. Sip on some of the best sparkling produced this side of the world, followed by a trip to the cellar. 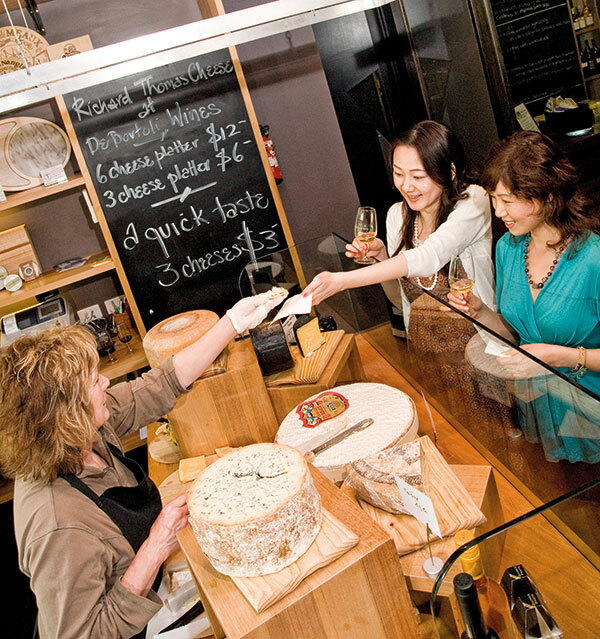 Then, nibble on cheese at a dairy farm, bite into decadent handmade truffles while watching them being created at a chocolatiere. Less than an hour from Melbourne, this is Australia’s Yarra Valley — full of scenic routes, select wildlife, hidden delights and rare moments. A classic Victorian expression ‘East, West, Hame’s Best’ is inscribed on the clock tower in the motor house. Hame is Scottish for home and this one is certainly fit for a grand dame. This is the place where the famous opera singer Dame Nellie Melba parked her De Dion-Bouton and Rolls-Royce cars. It is now a restaurant with a rear-glass conservatory that offers stunning vistas of the estate and the colonial building where she resided and hosted some of the best soirees of her time. Australian-born Melba was the first woman to ever grace the cover of Time magazine. Her circle of friends included Charlie Chaplin, movie idol Douglas Fairbanks and members of the royal family. She hosted some legendary dinner parties for Prime Minister Billy Hughes and British actor Ellen Terry. At every turn in the sprawling garden originally curated by the renowned landscape gardener and botanist W. R. Guilfoyle, you are rewarded with spectacular views — of terraced lawns, gardens, a croquet lawn, a tennis court and a rose arbour — all against the backdrop of the beautiful Yarra Valley. And you know you are witnessing history as you set eyes on the oldest functional swimming pool in Australia. This is where Chaplin swam during his vacations in Australia. The view from the conservatory, of the Coombe cottage garden, allows glimpses of the extensive colonial mansion with its bay windows, stately verandahs and French chintz furniture. At the Melba Gallery, you can find the dame’s Hermès riding boots, Cartier handbags, a century-old 14-piece set of Louis Vuitton luggage and a bearskin rug gifted to her by Chaplin. An insight into the lifestyle of Australia’s first diva, you can see how she strove for perfection, surrounding herself with the best of everything — from art to fashion. In her days, Melba was a generous supporter of young artists and musicians and works by artists Hans Heysen, Margaret Preston, Arthur Streeton and many others display her enthusiasm for truly appreciating the elegance, style and luxury of the period. Her estate represents seven acres of sheer beauty enclosed within 600 metres of cypress hedges. The gardens contain rare plants and beautiful old-world trees that provide an evocative and romantic setting, especially the most beautiful, hundreds-of-years-old English oak. Not too far away lie 50 hectares of vines planted about 15 years ago by Lord Vestey and Mark Vestey, descendants of the singer. The site contains some of the oldest vines in the Yarra Valley. What started as a hobby has in the last decade transformed into a vineyard that produces award-winning wines. The five-star vineyard has been the Dark Horse winner for 2015 presenting the best sparkling wine at the Yarra Valley Wine Show. In a very short span of time since it first opened its doors in 2014, the Coombe Estate has become one of the most unique gourmet and cultural destinations. This is where Australia’s swish set comes to lunch. Head chef Tony Milton cooks up some of the finest French and European cuisine, made mostly from home-grown seasonal produce, fresh from the estate’s vegetable gardens. The smoked duck breast with pickled plums and the Coombe farm peach melba with sour peach jelly, raspberry leather and caramelised peach is everyone’s favourite. We were informed that peach melba, melba toast, melba garniture and melba sauce were invented in 1892 by French chef Auguste Escoffier at the Savoy Hotel, London to honour the Australian soprano. At high-tea, one can relish elegant finger sandwiches, hot and cold savouries, freshly baked scones with home-made jams and clotted cream, and a selection of cakes and desserts on a three-tiered platter. Wash it down with a glass of Coombe Farm Nellie Melba Blanc de Blancs and tea or one of the best coffees in town. A highly Australian affair — the English way! Surrounded by picturesque vineyards, the luxury boutique Balgownie Estate is a haven. As I check into a spa suite overlooking the stunning views of the valley or sip on a cup of coffee on my private balcony, a sense of serenity envelops me. Even better is the view from the comfort of a full-size spa bath. As far as the eyes can stretch, there is tranquillity and elegance with no sign of urbanisation. Top notch! Wake up to the sounds of birds, breathe in fresh air or stroll through the paved pathway around the estate. The idea is to relax, unwind and do nothing. Unless of course you would prefer to head to the indoor heated swimming pool, or to the spa for a signature vinotherapy session or set out on a wine trail. Some of the best breweries and wineries are to be found just up the road. Go to any cafe in the valley, and you’ll notice that it embodies the spirit of the good life — excellent wines, great beers and cider, long lunches and dinners, wonderful people, charming interiors and food that’s made from locally sourced produce and served fresh. And of course that perfect cup of coffee made from locally roasted coffee. Meletos, for instance, is a regional cafe with high-vaulted ceilings and panoramic views that serves gourmet food with boutique beer and cider. Try the chargrilled octopus and barbecued Wandin quail. The wood-fired pizzas are a must. Explore a whole new world of cider at the adjoining Napoleone Brewery and Ciderhouse. Or, stop at Coldstream Dairy. They specialise in cheeses made using Yarra Valley milk and have some of the best Italian-style handmade cheeses, fresh feta and yoghurt. You could pick strawberries and enjoy the fruit of your labour with organic tea at the cafe. Sit in the courtyard of one of over 60 beautiful cellar doors as you savour the taste of the renowned wine region. A picnic with friends and family with wicker baskets and under trendy umbrellas would be just right. Or just grab a seat at the cafe-bar at one of the many microbreweries, cider houses and distilleries in the area. You could even take a quick tour to learn how they brew premium beers and ciders. At the Yarra Valley Chocolaterie and Ice Creamery, witness rows of premium chocolates through large viewing windows where you can see European chocolatiers hard at work. Treat yourself to ice creams and decadent sweet treats at the cafe. Their expansive lawns, orchard and sculptures make it the perfect place for children to play as well as for selfie ops. As the trip comes to an end, there is no better way to say goodbye than to fly back home business class on Singapore Airlines. Comfortable bed-seats, gourmet food, select wines, curated entertainment and personalised service add to the charm of a really good life! During the stopover at Changi Airport, get a complimentary makeover from Dior at the Shilla Duty-Free outlet’s ‘beauty loft’, and arrive home in style!